The red-shanked douc langur (Pygathrix nemaeus) is a type of colobine monkey that hails from southeastern Asia's Vietnam, Laos and Cambodia. This Old World primate is noteworthy for bold body coloration that includes reddish lower limbs, as their titles communicate. These tree-dwelling monkeys are closely related to their fellow douc langurs, which are black-shanked doucs (Pygathrix nigripes) and gray-shanked doucs (Pygathrix cinerea). Red-shanked doucs are labeled "endangered" animals on the IUCN's Red List of Threatened Species. Hunting is a serious risk for these monkeys, as is decline in habitat from logging activities. These gray-bodied monkeys follow diurnal living patterns and are usually out and about during the daytime. 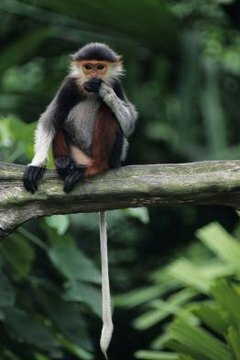 The typical weight for males is approximately 24 pounds; female red-shanked douc langurs tend to weight a little less. They are about 23 inches long. Red-shanked douc langurs are companionable animals; they usually stay in units of a maximum of 50 individuals or so. These groups are mixed-gendered, although females usually outnumber males. They inhabit semi-evergreen and evergreen forest settings alike. Limestone forests are also a common spot for them. Red-shanked douc langurs are folivores; they consume almost exclusively foliage. Foliage makes up roughly 75 percent of all of the food these monkeys take in. As far as leaves go, the monkeys gravitate toward tender ones. Apart from leaves, red-shanked doucs also readily consume bamboo shoots, buds, seeds, flowers and immature fruit. When it comes to sustenance, red-shanked doucs are rather generous creatures. They are not stingy, and they generally don't fight over fpod. As with many other colobine monkey species, red-shanked douc langurs possess sacculated, roomy stomachs that branch out into four separate sections, all of which consist of bacteria for cellulose deconstruction and absorption. These sophisticated stomachs aim to make leaf digestion easier. Red-shanked douc langurs that live in captivity have slightly differing basic diets than their free-roaming wild counterparts. Red-shanked doucs that live in zoos feed on lots of fresh vegetables and herbs, but they also eat primate biscuits -- ones that are made specifically for monkeys that eat large amounts of foliage.